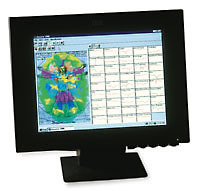 ..What Are The Program Features Of The Aurastar 2000? Each organ resonates and emits a vibration which we know is part of our energy field. The Aurastars advanced software program translates the energy read from each reflex point into the colour language of our body allowing us to see our full body aura. Over 1,200 colours are programmed revealing the exact frequency of the energy. The changing colours displayed on screen are the reflection of the flowing aura/energy which is read instantaneously from the biofeedback of the hand. 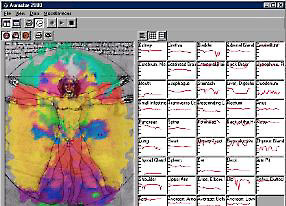 The biofeedback data received from each organ is shown on screen; the middle of the graph indicates normal range of the organs vitality and stress or instability of an organ is reflected in high and low values of the parameters. The sensor data is relayed in real time and allows us to study changes in thoughts and their effect upon the body. This mode provides a visual presentation of the vitality of each chakra... the brighter and more powerful the colours, the more open the chakras. The darker the colours or slower the movement, the weaker the chakra energy. The graph analysis can be used with the chakra picture. Each chakra governs an area of the body which is represented by various organs, glands and body systems. This feature allows you to instantly compare each chakra for the consistency of energy flow through the body. Body system imbalances can be the result of over or under active chakras. 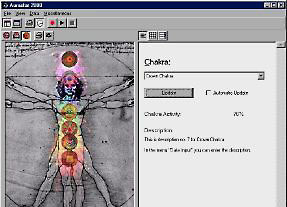 Either open the chakra window or click the cursor on any of the flowing chakras to see the activity of that chakra presented in a percentage figure. The text box can be customized with your data. This screen zooms into the body dynamics allowing you to analyze the body area more closely. The same features as the full body aura picture are provided. This format enables you to check the clarity of colour and description of each reflex point measured through the Aurastar sensor. Either open the reflex window or click on any area to display the zone and the vitality of that organ. This feature gives greater insight to the situation of that specific body part. The text box allows you to input data such as a description of that organ and its functions. ..How Can I Use The Aurastar 2000? With the Aurastar you can review the information provided with your client and give them an accurate reading of the vitality of their organs and chakra. For example, the graph illustrates the degree of vitality of the organs reflex zones in a graduating scale from 0 (bottom of the graph) to 100 (top of the graph), with 40 to 65 as the normal vitality of that specific reflex zone. Discussing with the client the high and low values in their body will determine if they are experiencing physical discomfort and/or emotional or mental conflicts in those areas. Amplitudes which fluctuate from a high to a low within the parameter may indicate the vitality of that organ is over-sensitive and may be the result of stress or conflict situations. This information is also displayed through the language of colour in the aura picture as well as in the chakra analysis. See the Sample Energy Analysis for an example of how you can use an aura picture in counselling. ..What Are The Benefits Of This System? Advanced state-of-the-art technologynew to North America! Complete full body aura picture. Record & replay datavisually compare the clients progress. Data input text boxesprint out interpretations or suggested therapies that you have entered. Different presentations and evaluations of the measured biofeedbackincrease clients awareness of how their thought influence their bodys organs, chakras and aura. Scientific biofeedback analysis in real timeinstantly validates your therapy/treatment. Business opportunityenhance/expand your existing services and increase sales on related products. Training to become an Aura Counsellor specializing in organ language and aura analysis. ..What Are Aurastar Owners Saying? We have conducted tests with the Aurastar at our energy center that we want to share with others. When Ive been tired and worn out and the Aurastar picture has shown brown or dark grey in the leg area, I have taken a red or orange foot bath and the colour in the picture has changed to yellow and, in certain instances, to green. The whole picture shows more balance and energy. Colour Energy Corporation is the North American educational, technical and marketing distributor of the Aurastar 2000. Information provided does not substitute professional medical advice and care.